A preteen overcomes fear to solve a century-old mystery. Tessa Woodward and her family have moved from warm, sunny Florida to chilly, gray Chicago. It’s bad enough that she had to leave behind her best friend and beloved beach, but as soon as the white girl moves into the eerie, rambling Victorian on Shady Street, myriad unexplainable things begin to happen. Lights flicker and doors lock on their own; mysterious crying and phantom footsteps echo throughout the house in the middle of the night; perfectly executed drawings appear in artist Tessa’s sketchbook; and her 4-year-old brother’s perennially creepy ventriloquist dummy cries actual tears. There can be no other explanation: this house is haunted. Who, or more likely what, has targeted Tessa, and why? 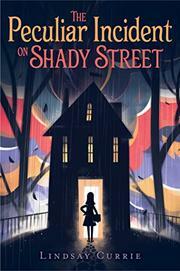 The terrified seventh-grader enlists her new friends—skeptic Andrew and graveyard expert Nina, both evidently white—to follow a trail of clues in order to find out what happened in the house on Shady Street all those years ago. Refreshingly, Tessa isn’t an angry kid determined to make her parents’ lives miserable in retaliation for uprooting her from the familiar. Instead, she resolves to make the best of things and to take her free-spirited parents’ advice that she keep her eyes wide open and explore the unknown. And that she does.